October | 2014 | Goin' Mobile - Adventures of a Travelin' Music Junkie! Kacey and her band took the stage at 2:00 pm, before Michael Franti & Spearhead, and though she is a petite, young thang, she confidently led her band of men. 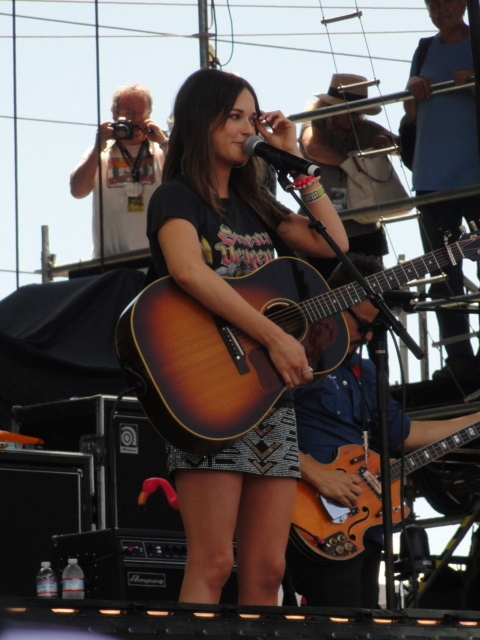 Dressed in a mini skirt, black t-shirt and cowboy boots, she played her acoustic guitar and sang gems from her hit album, “Same Trailer Different Park,” as well as many others in her stash. Her sweet, humble demeanor was endearing to the crowd, who focussed intensely on this singing,songwriting musician that most of them probably hadn’t even heard of yet. This talented young lady has written songs for Martina McBride, Miranda Lambert, Gretchen Wilson and more. But, she has the voice, the presence and the talent to hold her own. Her lyrics are different form the average country song – clever, descriptive and sometimes controversial – and, I highly recommend listening to her album, “Same Trailer Different Park,” which won ‘Best Country Album’ and ‘Country Album of the Year’ in 2013. And, in addition to these prestigious kudos, Kacey also won ‘New Artist of the Year’ and ‘Best Country Song’ for ‘Merry Go Round.’ This young lady is surely just beginning a long, successful career in the music business. Atta girl, Kacey!! Next up: San Francisco’s own….Train!